"We estimate this straightforward project, will save the Trust more than 350 tonnes of CO2 and £70,000 per year. This is around 1% of our 2007/08 baseline energy figure." 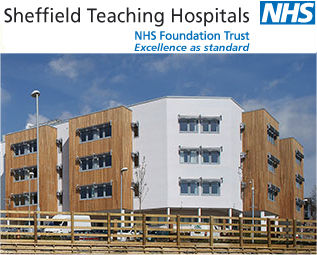 Sheffield Teaching Hospitals NHS Foundation Trust (STH) is the UK’s largest NHS Foundation Trust and one of the largest and busiest teaching hospitals. The trust employs over 13,000 staff and is proud to be in the top 20% of NHS Trusts for patient satisfaction. The Trust has been awarded the title of ‘Hospital Trust of the Year’ in the Good Hospital Guide twice in three years and is a recognised leader in medical research for bone, cardiac, neurosciences and long term conditions such as diabetes and lung disease. STH operates a large and complex desktop computer infrastructure spread across multiple physical locations. Around 7,000 PC based computers are used for patient care, record keeping and associated administration. STH has a focused programme to ensure sustainability becomes embedded into the Trust’s business. The Sustainable Development Programme is tasked with meeting sustainability targets (including the NHS carbon reduction targets), informing and motivating staff and stakeholders through the ‘be green’ campaign and maximizing the funds available for direct patient care. The PC energy waste project enabled STH to reduce unnecessary energy wastage and achieve both financial and carbon savings by reducing PC running costs. PC power management poses particular challenges in a hospital environment. The hospital is a 24/7 operation and a key concern for the organisation was that any PC power down should not negatively impact patient care, patient safety or the effective delivery of the services. STH selected Sheffield-based Data Synergy’s PowerMAN software to both investigate PC utilisation and then implement a remedial action program. Data Synergy’s PowerMAN PC power management software comprises a small agent that is installed onto each PC and a central data server. The agent records each computer’s usage pattern and reports this data in an anonymous form that does not include any information about specific users or their activity. The server is used to aggregate this data and report PC usage statistics. Was the computer powered on? Was a user logged on? This information can then be analysed using the built-in reporting tools to determine the level of PC utilisation and energy waste. An inactive PC means that the computer is turned on but is not accessed by the user moving the mouse or pressing a key. The monitoring exercise found that over 300,000 hours of identified PC inactivity were being recorded each week. STH estimated that this waste was equivalent to almost £100,000 per year and quickly decided that it had to be dealt with. "Through the information provided by the PowerMAN reports, it was easy to understand which power management settings would be most beneficial to different computers around STH as you could pull off the information on usage and wastage patterns over any period of time (since implementation)." To implement a remedial programme it was vital to identify PCs that were required 24/7 or used in the delivery of patient care. The team identified these computers using a combination of the PowerMAN reports backed up by Active Directory information and through an effective, well managed communication process with PC users. Around 1,000 computers were identified for initial exclusion from the power management project based upon computer function and clinical need. This left around 6,000 computers for active power management. In addition to this, on the 22nd April 2010, all PCs (with the exception of Picture Archiving Communication System (PACS) computers in Theatres) had the screensaver set to ‘black’. This was to save on the processing power required for other screensaver types. Savings from this aspect are difficult to quantify as it would depend on which screensavers were being used previously; however a rough average was assumed at around £10,000 and 50 tonnes of CO2. Managers of each Directorate within the hospital were contacted via email and informed of the project. Managers were asked to note down the serial number of any essential PCs which had to be excluded in their department from the strategy. Good communication was vital to the project’s success. 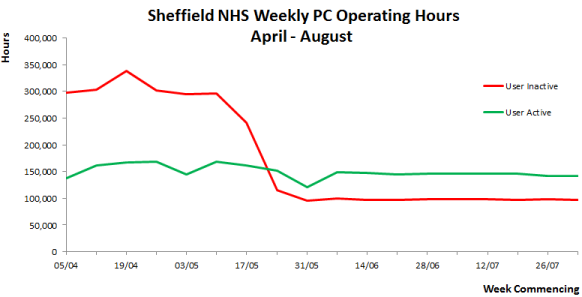 The project went live on the 19th May 2010 and the reduction in PC waste was immediately obvious. Following roll out, refinements to excluded PCs is ongoing, with the IT department receiving information from the users as to required changes. "By ensuring effective communication through the 'be green' campaign on the aims and expected outcomes; STH staff have recognised the value of this project and have accepted the changes wherever possible. The IT department have been vital to the success of this project, both in terms of the technical installation but also for being the point of contact for making adjustments to exclusions and settings on a case by case basis. Through the 'be green' campaign, we will continue to inform users of the value of themselves shutting down PCs and monitors when they are not being used. This programme, however, will allow for those times when people forget, or are called away unexpectedly.."
On a conservative basis the saving from the ‘shutdown project’ was estimated to be worth at least 300 tonnes of CO2 per annum and £70,000 per annum. This is based on a conservative estimated average PC consumption per hour (0.06KW) and average cost of electricity (£0.10/kWh). "The PowerMAN deployment has been an opportunity to show how Departments at STH can work effectively together to ensure that resources are not wasted through the use of Information Technology. The project has encouraged us all to consider the impact of our services and to behave as good corporate citizens while continuing to provide effective, high quality healthcare." "We estimate this straightforward project, will save the Trust more than 350 tonnes of CO2 and £70,000 per year. This is around 1% of our 2007/08 baseline energy figure. Direct financial savings are achieved by reducing the energy being used by computers being left idle by users. In addition to the direct savings, the Trust will also reduce its future liabilities relating to carbon emissions and the CRC programme." 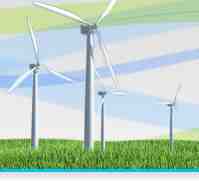 This project is a good example of the aims of the Sustainable Development Programme. Other projects are being implemented over time which will reduce consumption of resources and will aim to ensure the care provided by STH can continue into the future. We are very grateful to Katarina McCartney, Sustainable Development Manager at STH, for permission to republish this case study.